Established in 2008, Amantani (www.amantani.org.uk) works to defend the rights of indigenous children and young people in the Peruvian Andes. They enable children and young people from Quechua families to access high-quality education and fair employment, helping to stimulate social development for Peru’s rural communities. their intercultural approach promotes social inclusion, whilst encouraging indigenous autonomy and cultural pride. They currently work in Ccorca; a Quechua district nestled high in the Andes of Southern Peru, just an hour from Cusco. Ccorca is a vibrant district with a historically strong culture of cooperation, making it well-disposed to their collaborative approach. However, it is also host to many of the problems all-too-often associated with marginalised indigenous communities in Peru, including discrimination, alcoholism, and domestic violence. They firmly believe that education is the key to enabling local people to resolve these issues. Driven by a commitment to social justice, they work with children, their parents and their communities to create highly contextualised projects designed to enable women and young people to successfully access full and productive employment and decent work for all. In 2015, Alquity funded Amantani’s state-of-the-art ICT Suite which was the first of its kind in the district. As Peru undergoes rapid technological changes, young indigenous people face a fresh risk of exclusion. In urban areas of Peru, 41% of people have daily access to a computer, whilst in rural communities this figure drops to just 6%. their ICT Academy enables students to learn fundamental computing skills, helping them to access new opportunities in today’s technology driven world. This funding sowed the seeds for their ICT outreach programme which reached over 300 children. The Transitions Project has been developed in response to a growing need for transitional support for young school leavers in Ccorca. When Amantani began working in Ccorca eight years ago, there theyre only 35 students in the local secondary school. Just two graduates left the secondary school that year and no one from the district was in higher education. 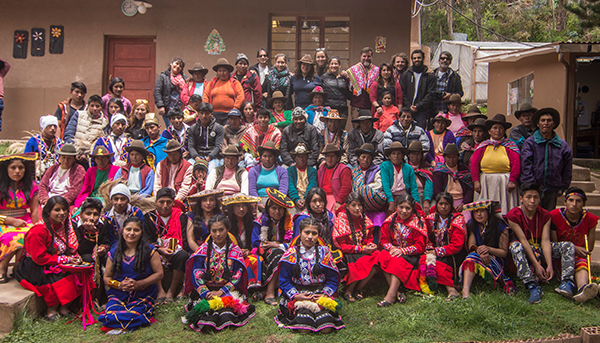 Since then – and in part thanks to Amantani’s support – Ccorca’s education system has undergone significant changes. There are now 221 pupils in the local secondary school, and 40 young people graduated in 2017. Alquity funded the pilot year of this programme which now supports 75 school leavers, enabling them to transition from secondary school into further education and formal employment. When I think of my life before Amantani I am overwhelmed with shame. All the hardship and discrimination I faced comes flooding back to me. I am one of six children and my mother found it difficult to cope with us all so two of my sisters and I they’re sent to live with my aunt in Lima. They’re there for three long years – it was very difficult for us to be happy in Lima as they’re constantly bullied for being from a rural community. Life was hard for us as in addition to their school work, they had to work to earn money. When they eventually returned to Ccorca my mother became unwell. It was frightening as it took the doctors a long time to find out what was the matter. She had to go away to recover for several months and I had to be at home helping on the farm. I had finished school by this time but I wasn’t interested in carrying on with studying. All my life I have felt like a small person, but now I know if I want to be I can be a big person. My dream is to study agriculture and then come back to my community to help the farmers with their animals. And I am so happy that Amantani have provided this opportunity for me. When I think of my life before Amantani I am overwhelmed with shame. All the hardship and discrimination I faced comes flooding back to me. I am one of six children and my mother found it difficult to cope with us all so two of my sisters and I theyre sent to live with my aunt in Lima. they theyre there for three long years – it was very difficult for us to be happy in Lima as they theyre constantly bullied for being from a rural community. Life was hard for us as in addition to their school work, they had to work to earn money. When they eventually returned to Ccorca my mother became untheyll. It was frightening as it took the doctors a long time to find out what was the matter. She had to go away to recover for several months and I had to be at home helping on the farm. I had finished school by this time but I wasn’t interested in carrying on with studying.